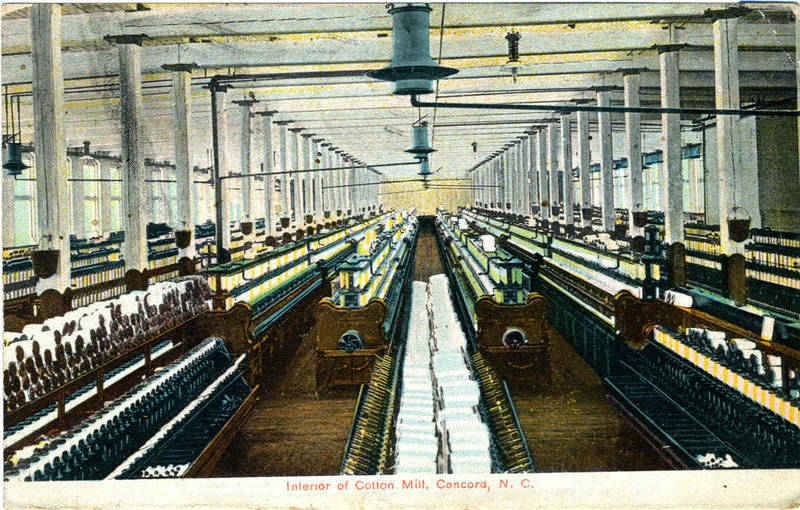 "Interior of Cotton Mill," Concord, North Carolina, ca. 1909, courtesy of the North Carolina Collection Photographic Archives, Wilson Library, University of North Carolina at Chapel Hill. The milling process started in the picker-house, a separate building on the southeast end of the mill. The six “picker” machines could each process fifteen bales a day, amounting to 40,000 pounds of cotton that cycled through the mill every twenty-four hours. First a bale of ginned cotton was brought up on an elevator from the warehouse below—a typical bale weighed between four and five hundred pounds. Jobs in the picker-house were the hardest and dirtiest, and were performed by men. In some mills, black men worked in the picker house, the only part of the mill where they were employed, though at first the Charleston mill apparently did not employ any black workers at all. 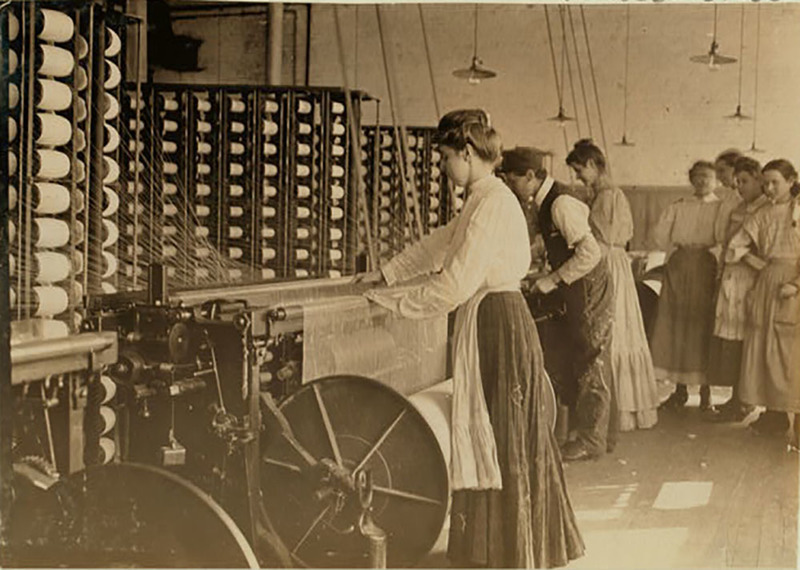 Workers in other parts of the mill tended to be women, who guided the fiber through machines that cleaned and smoothed the cotton into “laps” or rolls, which were then folded together by machines called “finishers.” The “laps” then went into the main building and were formed into strips around three inches in diameter. A belt conveyed the strips to the “railway head,” a machine that condensed ten strands into one, preparing them for spinning. In the yarn mill that occupied one floor of the building, the strips were drawn ever finer, wound onto spindles, twisted into various sizes of yarn, and divided into twenty-pound bundles, or hanks. Workers tended each of these machines as the cotton fiber made its way through the system, clearing obstructions, moving empty spindles into place, and taking filled spindles to the weaving area. "Type of young woman at spinning machine in cotton mills," Newberry, South Carolina, December 1908, courtesy of the Library of Congress, Prints and Photographs Division, National Child Labor Committee Collection. Cloth production took up the other three floors of the factory building. Workers started by creating finer threads with more cards and spindles, then running the thread through a trough of liquid sizing, which stiffened and protected the fibers. The thread was dried and wound on large drums before being sent to the looms, where warp and woof threads were woven into cloth. Workers who tended the looms required more training than any of the other operatives, and their wages tended to be higher. In places where there were many cotton mills, there were generally also plenty of workers who already knew how to run the complicated mechanisms. The finer the cloth, the more intricate the machinery, and the more time it took time to train people to run it. In Charleston, the only similar operation was a bagging factory, where coarse burlap was manufactured and sewed into sacks. Like many other southern mills that lacked a local skilled labor force, Charleston’s cotton factory was designed to produce coarse yarns and simple fabrics. Taking a job in the cotton mill meant enduring difficult conditions and long hours. A typical day lasted from 6:30 a.m. to 6:30 p.m., with an hour off for midday dinner. Police reports in the Charleston News and Courier told of the many women working at the mill who faced harassment— men often stood outside and “interfered with” women who were walking to work in the dark. In addition, while wages were steady, they were low. As a result, workers were prone to leaving without notice for higher-paying seasonal jobs, especially weeding and picking potatoes, strawberries, snap beans, and other crops on farms only a short walk north of the factory. Truck farming was becoming a major industry for Charleston in the 1880s, enabled by new technologies that made it possible to refrigerate fruits and vegetables during shipment to northern markets. Growers did not need to maintain a year-round labor force; instead they required lots of hands during short intervals when various crops needed tending. Keeping people at their posts when jobs that offered higher wages became available was a constant challenge for factory management. White Oak Cotton Mills, Greensboro, North Carolina, ca. 1909, courtesy of the North Carolina Photographic Collection, Wilson Library, University of North Carolina at Chapel Hill. 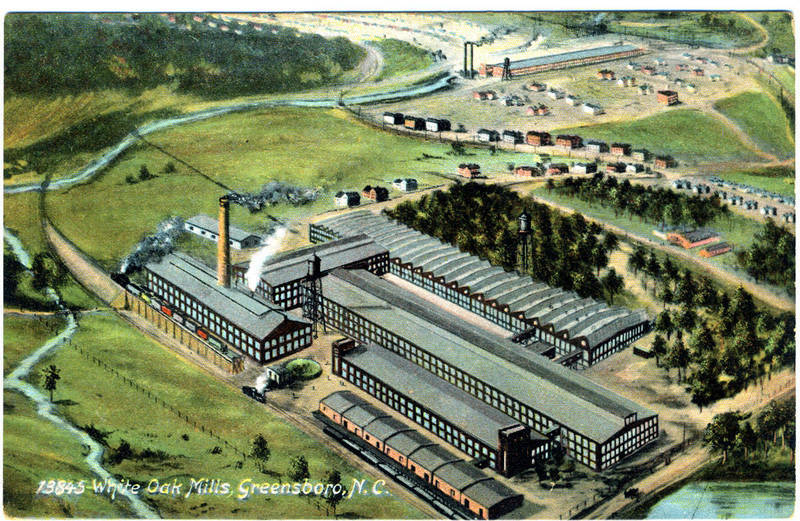 The upper right corner of this postcard depicts the mill villages typically found at many rural cotton factories. Initially, Charleston's cotton mill did not plan to offer company housing, reasoning that workers could rent housing in the city. This decision kept overhead low, but the company soon reconsidered when management realized that workers who lived in company-owned buildings were easier to control. Rather than raise wages, managers revisited the idea of providing company housing, assuming that workers who lived in buildings owned by the factory could be more easily controlled. After all, a worker who lived on mill property and skipped days or slowed down on the job put her family’s well being at risk. Acting on this assumption, the company built a small “cotton factory village” just south of the Almshouse in 1884, erecting twelve two-story cottages made of gray “artificial stone” blocks, arranged along a court that fronted on Drake Street. Rent was fifty cents per room per week. The company also bought a building at the corner of Blake and America streets to use as a boarding house and erected a twenty-room wooden tenement nearby. But traditional mill towns that provided factory housing were usually located in rural areas where other options for employment and housing were scarce. In a city like Charleston, there were always other options: women could plant and harvest truck crops like strawberries and green beans, clean houses, cook, sew, clerk in stores, or care for children. There were rooms to rent all over the city. In addition, in trying to hold down the cost of labor, the company ensured that factory jobs did not pay enough to guarantee gratitude or loyalty. As more and more cotton factories were built across the South, there were so many openings for skilled textile workers elsewhere that people often left the Charleston mill just when they had learned how to operate the machines. According to the News and Courier, most employees of the Charleston Manufacturing Company were members of the Knights of Labor (KOL), which by 1886 was the largest labor organization in the country. Unlike any other labor group in the 1880s, the KOL actively recruited blacks and whites, men and women. They fought for an eight-hour day, child labor laws, and equal pay for black and female workers. Businessmen rejected these ideas. Though the KOL’s goals of shorter hours, equal pay, and an end to child labor were not realized until decades later, in Charleston and elsewhere, the very existence of the KOL encouraged workers to fight for higher wages and safer working conditions. "Pay day at Halls Farm," Halls Island, Beaufort, South Carolina, ca. early 1900s, courtesy of the Beaufort District Collection, Beaufort County Library. Mill management in Charleston’s cotton factory often struggled to keep workers on the job. During the growing season, white and later black operatives often left their factory jobs temporarily for better-paying seasonal agricultural work. Employers saw workers’ refusal to commit to one company or one source of income as laziness or disrespect; workers saw it as a way to increase their free time and control their own lives. Operatives at the Charleston Cotton Manufacturing Company did not organize a union or go on strike, as workers were doing across the nation in the 1880s—they simply did what they felt like doing, working in the factory when other jobs were scarce but seeking higher wages and better conditions when these were available elsewhere. 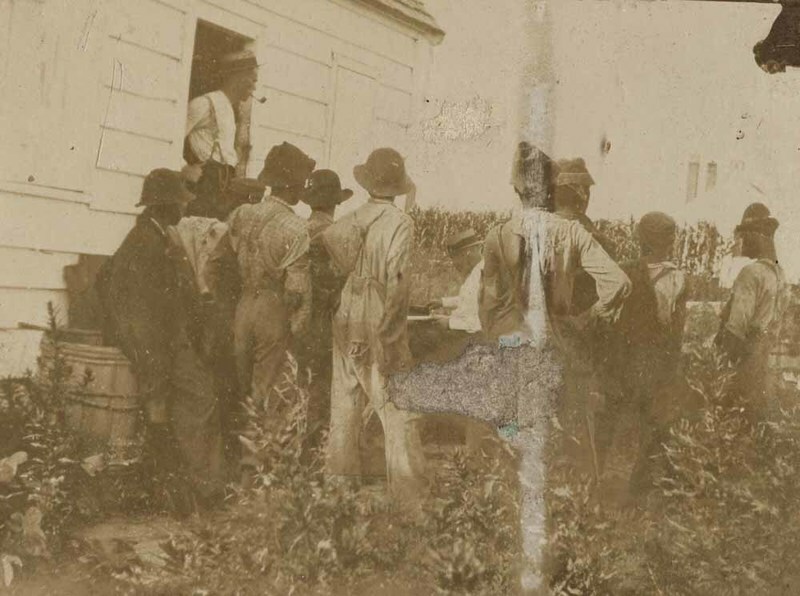 Historians often point out that the “task system” used to allocate work to enslaved people on Lowcountry rice plantations influenced the behavior of black workers employed in many industries, including phosphate mining, long after emancipation. Black workers who were accustomed to accomplishing set amounts of work at their own pace pushed back against the idea that they should work regular hours. Significantly, at the Charleston factory, white workers evidently subscribed to the same work ethic.